Fast, Cheap, and Out of Control: a robot invasion of the solar system. 1989. Rodney A. Brooks, Pattie Maes, eds. 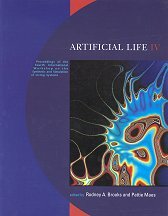 Artificial Life IV: proceedings of the fourth international workshop on the synthesis and simulation of living systems, Cambridge MA. In the mid 1980s AI robots seemed to be going nowhere. Robots placed in carefully sanitised highly artificial environments, with only a few easily seen stationary geometric obstacles, nevertheless spent forever observing, building models and planning before they moved an inch. The only improvements occurring seemed to be due to rapidly increasing computing power, rather than advances in the underlying mechanisms and theory. He who deliberates fully before taking a step will spend his entire life on one foot. Rodney Brooks decided it was time for a radical rethink of the entire approach. No more "cheating" by making unrealistic assumptions about the environment and the robots sensors -- instead require the robot to interact with the real world in real time. No more careful planning -- instead try building the simplest possible behaviours and, only once they are working, incrementally add more sophisticated ones. No more internal model building -- instead use the real world as its own model. And avoid the potential infinite regress of symbolic meaning by being fully grounded in the real world. Do all this and watch "intelligence" emerge as an interaction with the complex world, just as it has in reality. (But don't keep too close to evolution -- it uses blind chance, not design -- and has no purpose, no goal. It should be possible to design efficient useful behaviours.) Braitenberg's vehicles did this in theory -- how would it work in practice? Brooks developed the subsumption architecture, where higher layers of behaviour subsume lower ones as and when appropriate. Start off with the simplest underlying behaviour -- avoid -- that stops the robot running into obstacles, and makes it dodge moving ones. Overlay a more complex one -- wander -- which adds random movement, but doesn't have to worry about avoiding things: that's already been taken care of. Then add another one -- explore -- to make the wandering behaviour less random. Then add another one -- map -- so the robot can revisit previously explored places (but keeping the map highly distributed, and using it to navigate without planning a route). And so on. The approach was a stunning success, although not without its detractors. In a very short space of time -- only a few years -- Brooks and his team at MIT had small autonomous robots scuttling around their unmodified cluttered office space full of moving obstacles (people), acting and reacting in real time, using highly distributed and very simple control circuits to perform apparently complex and intelligent tasks. This book collects together six of Brooks' papers from the late 1980s and early 1990s, with a short introduction to each, describing and explaining the subsumption approach, and rebutting the critics. Because it is a collection, there is some overlap and repetition. But the papers are lucidly written, and give a clear account of the state of the subsumption art at the turn of the last decade. The last paper also outlines several fascinating and exciting research topics for taking the field further forward. Given that rapid progress ten years ago, now I want to know, what happened in the 1990s? How did those research topics pan out? What are the little critters getting up to now? Did the approach scale up, or hit some new obstacles? Is there a follow-up volume? What doesn't this book have a postscript? A Robust Layered Control System for a Mobile Robot. 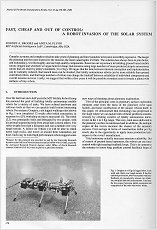 IEEE Journal of Robotics and Automation, RA-2, 14-23, April 1986. A Robot That Walks: Emergent Behaviors from a Carefully Evolved Network. Neural Computation, 1:2, 253-262, Summer 1989. Learning a Distributed Map Representation Based on Navigation Behaviors. Proceedings of the 1990 USA-Japan Symposium on Flexible Automation, Kyoto, Japan, 499-506. Intelligence without Reason. Proceedings of the 1991 Joint Conference on Artificial Intelligence, 569-595.
p28. He has carried this conviction for more than twenty-five years, and his latest research project at Carnegie Mellon University is his umpteenth implementation of an even better three-dimensional reconstruction program. I have tried to convince him over the years that (1) animals, including humans, do not make accurate three-dimensional maps and are still able to act intelligently in the world, and that (2) once he has these maps he is going to have to do something clever with them, so perhaps it is worth thinking about that problem a little now in order to guide requirements on the characteristics of the maps. I have yet to succeed. p36. Judging by the projects chosen in the early days of AI, intelligence was thought to be best characterized as the things that highly educated male scientists found challenging. In fact, it's the everyday problems: movement, navigation, recognising and manipulating things in a complex noisy environment, that have posed the main challenges. As well as castigating the GOFAIers, Brooks also lays into those carbon chauvinists who deny that "mere machines" could ever be intelligent or have real emotions, but rather claim that something extra is needed. He dismisses the circular "arguments" against "mere machines" of people like Penrose and Searle, identifying them as "tribalistic" arguments of people who can't bear to give up the idea that we are somehow special, somehow other. p180. Like Searle's Chinese Room, there is no real argument made against a beer can computer being intelligent---mere ridicule is used. Sort of like the idea that the world can't possible be round because everybody in Australia would fall off. Ridicule does not make a valid argument. Ridicule instead of reason is a well-known refuge for tribalism. (However, this dismissal seems to ridicule the use of ridicule.) He claims an existence proof that machines can have emotions, because we are machines. He does have the feeling that there is something currently missing from our descriptions, which he calls "the juice", and cheerfully admits he has no evidence for this claim. However, he does not believe that this is necessarily anything new, just something we haven't recognised yet, and is not something that we couldn't build into our machines. p188. When I first expounded this theory at a workshop in Switzerland, I was forty years old. At dinner that evening a young graduate student from Oxford told me that what I had said was very interesting and that he thought a lot of people came to similar sorts of ideas when they were in the sunset of their careers. So what has Brooks been up to more recently? It seems one of the ways he has branched out is to make commercial robots. He too promises us the house cleaning robot soon [still waiting! ], but his main foray seems to have been to sneak these critters into our homes in a friendlier way, as toys. This has required getting to grips with production engineering and marketing. He moves on to talk about the future. The first step is interesting: he suggests that the first major use of domestic robots might be to provide us with telepresence, providing us with robots that we control, instruct, and guide around our houses via a high-level Web interface. Don't worry about providing the robot with those difficult higher levels of reasoning and intelligence, just use the subsumption architecture to provide the low level motor controls, allowing the "driver" to issue higher level commands. He weaves some interesting scenarios in this area. p229. When we think of our own [telephone] number, we do not conjure up a visual image of the digits. Instead, the "number," whatever that means, is just there. When I read this, I thought "speak for yourself!" When I think of a telephone number, I do get a visual image of the digits. Moreover, I have no idea how else I could possibly think about a number. (Except for small numbers, where I get a visual image of something more like a dice face pattern.) Brooks' mental representations clearly are very different from mine. If we all have internal representations that differ so dramatically, there may be no one single technology that provides the promised augmentation. But it's going to be fun getting there, and I suspect that Brooks' approach has a lot to offer.